Last week Romesh and I made a fantastic Sri Lankan curry but of course that is not the full story, so while the chicken was bubbling away we turned our attention to the supporting cast. There are numerous condiment dishes normally served which compliment and enhance the main star. For example many countries around the Indian ocean rim have a version of the coconut dish Pol Sambol. Known simply as sambal in my own country Malaysia, whilst in neighbouring Indonesia and Singapore it comes in numerous varieties such as sambal belacan made with dried shrimp, sambal goreng a fried version and even sambal tempoyak made with fermented durian and anchovies!! But before you stop reading the version which has become our favourite is actually from the island of Sri Lanka. It was Romesh of course who introduced me to this one. It is fantastic with curries, dals and pulses, grilled meats and rice which the zingy lime and chilli cuts straight through. A word of caution though it can be spicy for the uninitiated so use discretion with the chilli! By the way Maldive fish called for in the recipe is dried tuna and is a staple of those islands' cuisine as well as Sri Lanka's. It does enhance and improve the flavour but if you leave it out don't worry. Finally when grating the coconut you need to be careful it doesn't become a paste. Our local Thai shop On Hogarth Road in Earls Court has a wonderful grater and does it for us. Break open the coconut shell, remove the flesh and grate with a box grater. Chop the onion or shallots very finely. Add the coconut, onion, garlic, chilli and fish (if using) together and squeeze in the lime juice and mix well. Similarly Moju is designed to complement curry dishes. 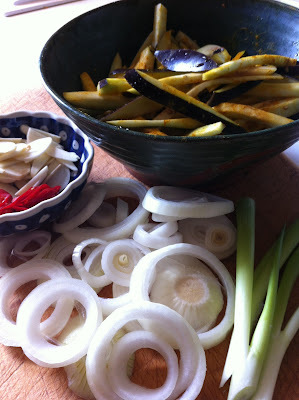 It is a Sri Lankan pickle made from aubergine, onion and vinegar. Put half the mustard seed in a bowl and cover with vinegar and stand over night. When ready to prepare slice the aubergine into strips, add salt and turmeric and allow to stand for 15 - 20 minutes to extract bitter juice. Meanwhile put mustard, vinegar and sugar in a blender with the ginger and garlic and blend until smooth paste. Heat oil and fry remaining mustard seeds till they pop . Add paste and cook for about 5 minutes. Fry aubergine and onion separately and drain and combine with paste. Add salt to taste. Rinse dal until the water runs clear then add the turmeric and boil (uncovered) in water at least one inch above the pulses until soft (about 10 - 15 minutes), topping up with hot water if necessary. Meanwhile heat the oil in a pan and fry mustard seeds, cinnamon, chilli powder, onion, pandan leaf, curry powder and leaves until aromatic and the mustard seeds start to pop and dance! Finally add garlic and cook for a further one minute. 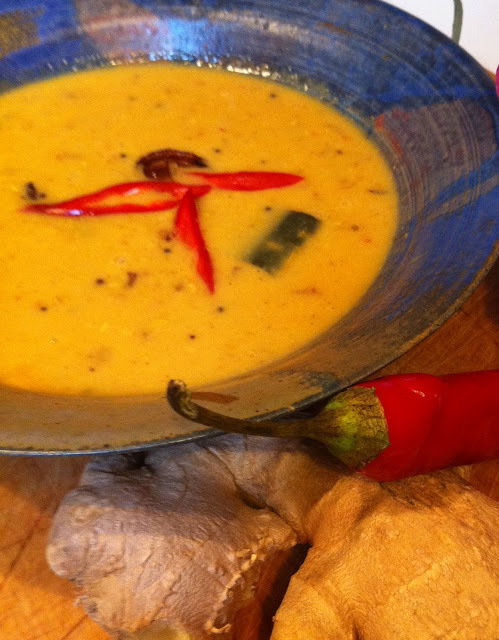 Combine well and add to the dal together with coconut milk, lime juice and salt to taste.